MANGO season has been officially launched in Qld with the symbolic first tray of the season fetching $13,000 at the Brisbane Markets this morning. 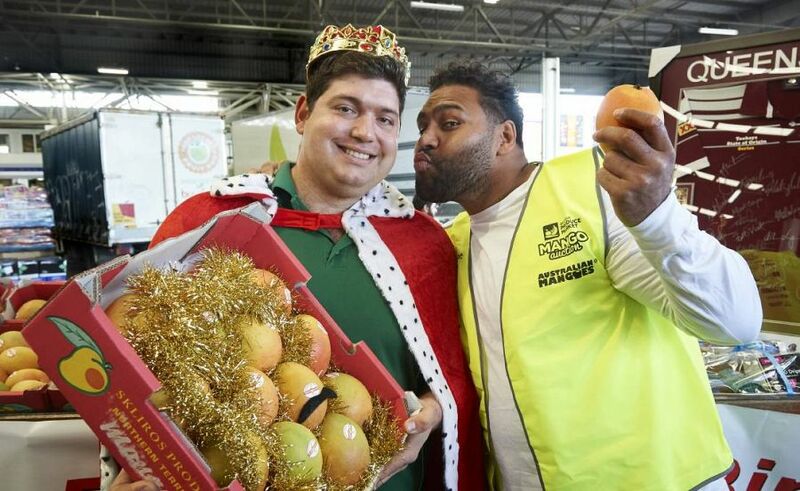 Domenico Casagrande of Megafresh in Carina and Chandler claimed the 2018 Mango King crown after his top bid at the Brisbane Produce Market Annual Charity Mango Auction. The tray of mangoes from Skliros Produce in the Northern Territory hit the auction stand at around 7am with crowds of bidders vying for a chance to hold the Mango King title while raising funds for Diabetes Queensland and the MND & Me Foundation. Last year’s Mango King, Nuccio Camuglia, owner of Fruity Capers in Toowong, was beaten to the punch for the crown, with Mr Casagrande outbidding him at the last minute. Mr Casagrande said mangoes were a summer favourite of Megafresh, and the Annual Charity Mango Auction was the perfect way to give back to the community. “This is the first year I’ve attended and placed a bid at the mango auction, but really wanted to go in with a plan and give it a good crack,” Mr Casagrande said. “After the amount of support we have seen from the community over the years at Megafresh, we really wanted to give back to the community at today’s auction. “After all, the community are our customers. Brisbane Markets Limited chairman, Tony Joseph, said the Brisbane Produce Market now hosts the only Mango Auction in the country, and annually brings fruit shop owners across Brisbane together. “Mango season is one of my favourite times of the year, and our annual mango auction is the perfect way to remind us that summer’s on the way,” said Mr Joseph. “With the winning bid for this year’s symbolic first tray of mangoes and our combined fundraising activities associated with the Mango Auction, we are thrilled to donate over $20,000 to charity in 2018. Since 2002 the Brisbane Produce Market Annual Charity Mango Auction has donated just shy of $1 million to charity thanks to the generous support of bidders and attendees each year. The Brisbane Produce Market Annual Charity Mango Auction was attended by Your Local Fruit Shop ambassador and recently retired NRL heavyweight, Sam Thaiday, and hosted by Ben Davis.